Twin Rocker This twin shape has minimal rocker featuring a long, stable flat zone that extends well beyond the inserts into the tip and tail. Also provides a playful feel in the park. Twin A twin snowboard is perfect for riders who want to ride switch sometimes too. Foundation Core Tip-to-Tail Aspen wood core with proven durability that retains pop and flex. Biaxial Glass 90° and 0° angles are fun and forgiving. Ride's unique glass designs are flatter and more consistent; therefore they are stronger with no gaps or stretching as can be found in woven glass. Slimewalls® RIDE's exclusive Slimewalls® are forgiving and ductile, absorbing impacts rather than defending against them. Just like your skate wheels, the urethane in Slimewalls® smoothes the interaction with the snow, wood or metal surfaces you may ride on. On top of all that, these babies are virtually indestructible, the most durable sidewalls in snowboarding. Fusion 1500 Base Highly wax absorbent and easy to repair. Die-Cut Base Base color displayed may not be available. 2 x 4 Insert Pattern. MagneBed 2.5R Full-length EVA footbed with 2.5 of canting for better pop and endless butter, 3 specific foot receptor zone pads for shock absorption, as well as dual density padding, an adjustable toe ramp, and a patented magnetic closure system. Angled Ramp s The closer the toe ramp is to your boot, the more precise your ride will be. Rossignol angled the ramps on select bindings, expanding the contact surface with your boot towards the toe box, opening the door to a new board feel. 3D AsymWrap Highback Asymmetrical highback that mirrors Rossignol's canted footbeds to deliver enhanced fit and comfort no matter your stance angle or width. These highbacks wrap around your boot both laterally and vertically, delivering consistent boot and binding contact for instant power transmission and stability. Extruded Heelcup Tech 50% more response, 20% lighter. Micro-adjustments provide freedom of movement and infinite sizing and centering options. TallBoy Straps New high-density foam on the upper and lower sections of the strap provide increased energy transfer. Lower density foam in the middle section of the strap provides additional flex and instep relief. All of which is wrapped around a 3D molded spine for a comfortable, custom fit. AsymLight Buckle Asymmetrical diecast aluminum construction for durability and lightness with the freewheel ratchets for quick entry and easy exit. EVA Hardness Indicators All MagnePads and Triad Pads are made of a medial, toe, and heel pad, so Rossignol built each pad with a different hardness value (Shore A) for specific function. 50A to 60A delivers enhanced reactivity with a medium to hard value on the medial / toe pads. 40A Increases shock absorption with a softer value on the heel pad. Choose the best combination for your riding style and enjoy the blend of comfort and performance.. ORIGINAL RETAIL PRICE: 579.90. BE SURE TO CHECK OUT OUR OTHER AUCTIONS!! 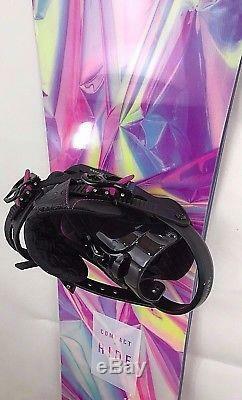 The item "RIDE COMPACT SNOWBOARD & ROSSIGNOL DIVA BINDINGS - WOMEN'S - BRAND NEW" is in sale since Wednesday, December 6, 2017. This item is in the category "Sporting Goods\Winter Sports\Snowboarding\Snowboards". The seller is "skibiz123" and is located in Mesa, Arizona. This item can be shipped worldwide.